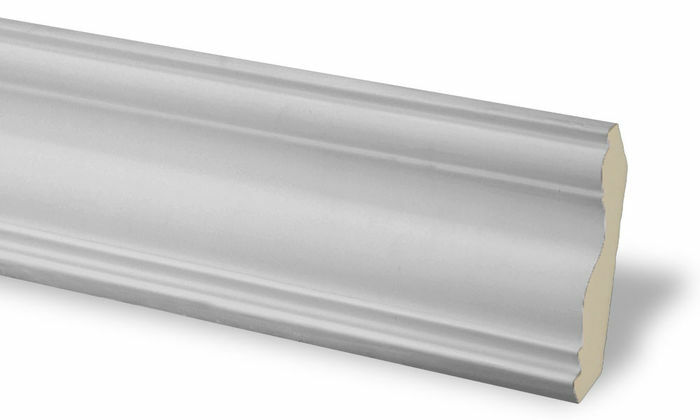 CM-1014 Crown Molding is a Plain, 3" breadth crown molding typically used in rooms with ceiling heights of 8'. 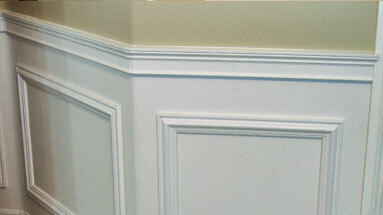 Beautiful crown molding at a fraction of the cost! Service has been great. The product looks great and delivered well packaged and just as advertised. 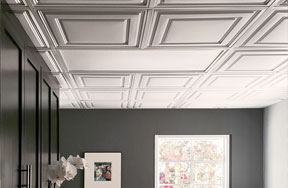 However, I have not yet worked with or installed this type of crown molding yet. Looking forward to the project. Easy to work with and looks good. Wish I had gone with all CM-1001 though instead. This is the second time I've used Udecor....The products are quality, inexpensive and give a finished look to our rooms. I put this in a walk in closet and it gave it the wow factor and completion. Very little caulking and the look is perfection! I'm sure it will look great! Had to delay my project until after the 1st of the year. I installed this in my nieces hair salon. The walls were uneven and had offsets and just looked so plain. 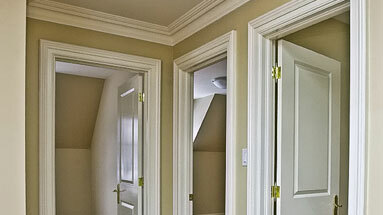 The crown molding enhance all of the rooms and they look wonderful. 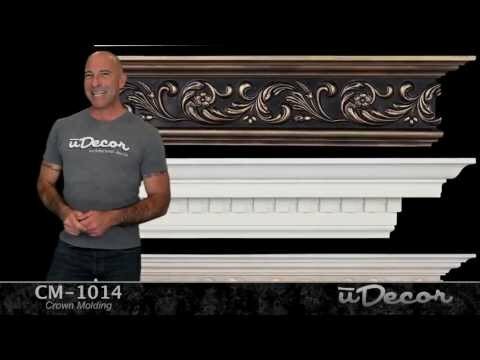 Udecor takes pride in their product. Each piece of molding is individually wrapped. You would never believe it’s foam. Best yet was the price compared to other companies. I’ve never installed crown molding before and after doing some research I decided on this product and I’m very glad I did. I did not use the first nail , my fastening of choice was Loctite Power Grab as this glue sets up fast and is a strong hold. I’ve received comments that my finished job looks professional and I’m very happy with the results. Product is very easy to cut and easy to install. Making joints so much easier that wood and looks exactly like wood product when finished. This is my third order with udecor. I keep coming back to them for my crown molding. I am renovating my home and this molding looks great! Paints easily. They also helped me with the videos to ensure I knew how to cut the molding. After watching, no mistakes made. I really enjoy the look the crown molding adding to my living room and dining room. It makes the room look more finished and provides a warm cozy feeling. When I describe it to my friends I equate it to getting dressed up to go out to a formal gathering by putting on a beautiful suit and then topping it off with a stylish hat. The hat being crown molding. Easy to use, cut etc. Walls look great more finished look. 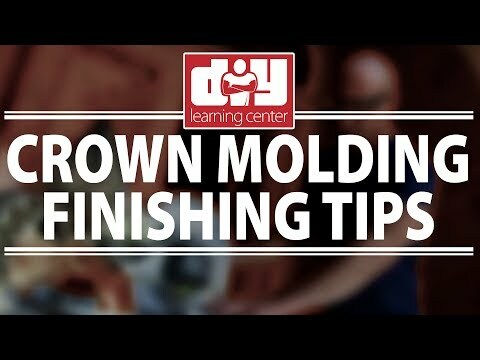 This molding was so much easier to install than other wood moldings. It looks so great and no one would know that it's not wood. It is so much less cost. I am a retired home builder. Never again will I use any other molding supplier. Shipped very well and quickly. I compared this product to all that was in store available at Lowe's and Home Depot. This was be far more attractive and decorative than either of those home stores. The finished installation is beautiful! I bought these in conjunction with the pre-cut corners. It was really easy to install, even though I had never done a crown molding project before. I'm glad uDecor recommended pre-painting the molding before we got them up on the wall. It's something I might have missed, if it hadn't been pointed out to me. We set up some cinder blocks so we didn't have to bend down as far to paint them. This is a relatively simple profile so we used a tiny, 3-4" roller to get most of the paint on, then finished it with a brush. The molding was so light that it was not hard to install at all. We didn't have to do any crazy cuts due to the corners that we also bought. After several weeks of renovation, we are finally putting up the crown molding----and it looks amazing!!! I hurt my back a few weeks ago and have not been able to help my husband with this project. However, the lightness of these pieces and the more-than-helpful video tutorial has been such a blessing for him! He has combined a few of the hints from the tutorial with his own skills and knowledge and our house is looking beautiful! We would definitely use uDecor. com again and will be telling my brother about these products as he is constructing a new home! Thank you for your service! I love the way this product finishes my room. We added corner pieces to accommodate our vaulted ceiling corner angles. No one at UDecor could tell us how to solve the corner problem. Unfortunately a lot of the pieces came with damage to them from the manufacturer. They were replaced promptly. Looks like wood, looks like it was installed when the house was built. The product was shipped promptly and the packaging was sufficient to protect the moldings. Simple-straight forward install, who could ask for more?? Did my whole house with udecor crown molding, which speaks volumes. Product was easy to order, came in on-time and undamaged. Installation was a snap and it looks amazing. I ordered the CM-1014 for my home. It looks amazing. Amazing pricing, amazing product. I do recommend order a bit more needed. We painted it black and it framed our ceiling beautifully.. Money well spent to take a room from ok to wow. This molding looks terrific in our home. We had purchased a larger molding for the rooms with a higher ceiling and this molding matched that pattern in a smaller version. Easy to handle and put up. Very happy with the quality and delivery was fast. Everypne loves the looks of it. These were very easy to install and made the entire job much easier. everyone loves that the crown molding makes such a huge difference to our living room and our contractor was amazed how easy it was to put up. Will definitely order more for my other rooms. The installation videos are the best! I have made several orders from udecor and each is received quickly, well packaged and at a fair price. A pleasure to do business with. Worked well. Favor your self and follow videos. Have a helper for sure. I have never done crown molding projects. Thank to this product and informational site, I am now working on my third project which is a complete house! Delivery is super fast and FREE! Product is great to work with. I would recommend this company and their product to anyone. I installed this in my main bathroom and it truly made the whole entire room pop. Easy to install and looks great. The product installed easy. I was skeptical when I opened the box up. I didn't realize that the product was a polymer but I followed the demo on YouTube for installation. I painted and caulked everything. The crown modeling looks amazing. I installed the whole house in 3 days. I painted then in the morning and hung that up at night. I already recommended this site to another. The savings on this product is worth not installing real wood or an MDF. I am a happy customer. Thanks, udecor. I am a diy newbie. I was able to cut these easily with s mitt saw and even successfully cut an outside corner. I used corner inside blocks from lowes only because i liked the look. I installed these in my bathroom and am very happy with it. Shipping was fast and each pice was individually wrapped and kept clean. Since they are very light weight they do ding easily and i did need to use more than construction adhesive--i used 1.5 inch nails and my air nailed gun. This product looks great, so easy to work with. I would recommend it to family and friends and anyone looking and/or thinking about this. The company is easy to work with and the videos are extremely helpful if you're new at diy projects. 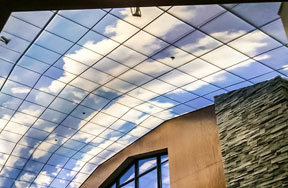 The crown molding finishes a ceiling tile install over popcorn. 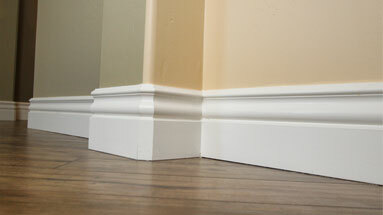 The molding is an excellent product and looks great! Easy to cut and its light weight makes for a quick install with 18 gauge 1 1/4" air nailer brads. Takes paint very nice. Perfect finishing touch for our bathroom...thank you! This is the 3rd type of molding we have purchased. Very nice and easy to handle. All products we have ordered from this company has been top notch. Service is good and shipping is quick. Will always shop here. Phone customer service was great. The product arrived promptly. The video was very helpful for a first time user. Moulding was easy to work with and gave the house a more finished look. It was smaller than I thought but it look very nice anyway. This is an excellent product from a customer service related company. The product arrived very quickly and was well packaged. I found it easy to install, especially with some help with sections over six feet in length. I found your online videos very helpful. I'd certainly recommend this molding to others. This product is amazing and looks great. My husband and I did my daughters room in less than hour, was super easy. He was able to cut the molding with a hand saw and miter box with no problems and nail it up wth brad nailer with no cracking or anything. Our whole house has regular crown molding and you can't tell the difference. Highly recommend this product. Ordered and it came super fast! The quality of the product is great and it looks very good once installed. Because it is very light in weight, installing it is quite easy. Using this crown to create entablatures for all entryways throughout the house. Easy to work with and it looks great! For those individuals that appreciate moulding in architecture this addition to our house stops them in their tracks! Thanks UDecor for producing a quality product! This product has some good points - but the corner pieces are a waste of money. 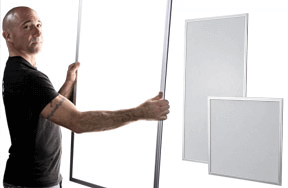 Overall this is an OK product, especially for a bedroom where there isn't too much light. Certainly it is inexpensive, and the appearance of the bedroom has been improved but it was harder to install than I imagined and required a lot of extra filling and painting to get a good result. 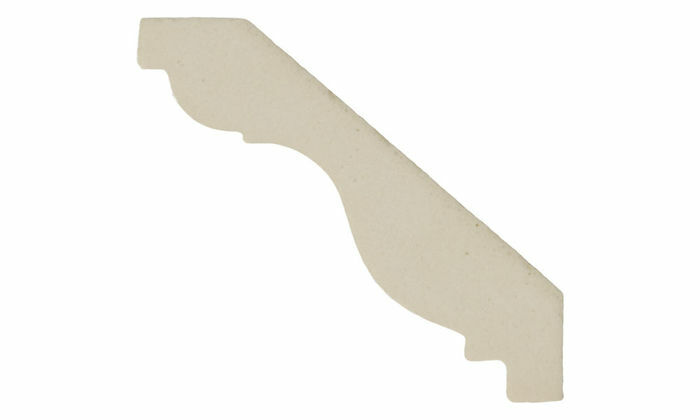 The most disappointing aspect was the corner pieces since the profile of the corner piece did not match the profile of the straight piece - so no way could you get a clean joint, even before the inevitable unevenness of the wall itself. I had to file each one and then use wood filler to get a reasonable fit. I would say don't bother with the corner pieces. Invest in a decent miter box and cutter instead. And for a living room with bright light, pay a professional to install a quality wood molding. Just finished installing in a vaulted, peaked room, and while vaults are frustrating, it sure made it easier since the material is lightweight. I would suggest Eric make a video on vaults up/down from a 90. There is a trick to it, plus, the spring angle won't match the material exactly, but I caulked it and you can't tell unless you get on a ladder and check! I'm very satisfied with the material and the finish. Based on this experience, I will order more for my other rooms. The price is right, and it is so much easier doing the job solo than using wood. Wood for everything else where structural integrity (base, casing...) is important for sure, but crown is well suited for this lightweight construction. I'm not handy at all -- just enough to want to do my own repainting. We had a room with a contractor-added ceiling and no crown molding (unlike the rest of our townhouse) and so I added CM-1014 with MC-1014 corners in just a few hours . . . . it makes a huge difference in completing the room! This product looks like wood and is easy to install but I made the mistake of buying the prefab corners after installing one I threw the remaining 16 corners away and built my own. The prefab corners are a waste of money. 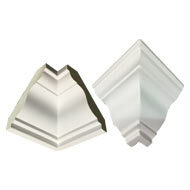 The crown molding is super lightweight yet very strong and durable with a nice smooth surface for painting. One of my bigger concerns about the polyurethane molding was how the air nailer would affect it. I thought that perhaps the nailer would dent the molding or that the nail would go clear through. No problems with either concern. The molding is truly a fantastic product, it cuts perfectly, attaches easily and could not look better ... so much better than any heavy wood product could. 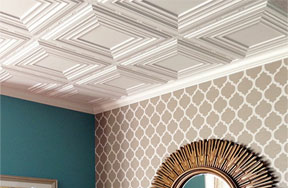 I'd like to offer a few suggestions for installing: Use a short piece of the molding (the sample works well for this) to mark the walls and ceiling with a pencil to provide a guide line for placement of the molding. Place wide masking tape (I used 1.41" Frog tape) along the lines on the walls and ceiling and then mark the location of the studs and ceiling joists on the tape as they make the best possible nailing points. I used a Sharpie pen to mark the studs and joists and found that the Frog tape did not let the Sharpie bleed through. Place a ¼” bead of Loctite Power Grab adhesive along the entire length of the molding to attach the molding along with a finish air nailer. 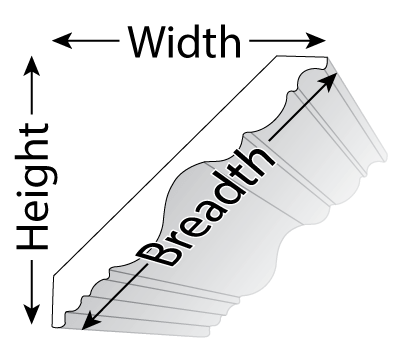 If you put the bead of adhesive near the front edge of the molding, it will squeeze out requiring cleanup, so run the bead along the rear edges where the molding contacts the wall and ceiling. The masking tape will also help prevent getting any of the adhesive on the wall and ceiling when positioning the molding. If you're doing the job by yourself, I'd also suggest the purchase of a couple of 3rd Hands. I made a simple bracket from scraps of plywood to attach to the 3rd Hand that held the crown molding near the ceiling while I positioned it. Love the product! Super easy to install! Highly recommend it!! Simple, looks good, and easy to pick up. Very easy to work with, and look great! Very light and easy to work with, perhaps 1 pound per 8 foot lenght. The adhesive caulk I used was stiff and made it tricky to compress it tight to ceiling and wall. Be conscious of that possibility. easy to paint and it looks great in my kitchen. Wonderful product, great looks and good price. I'll recommend to everyone. 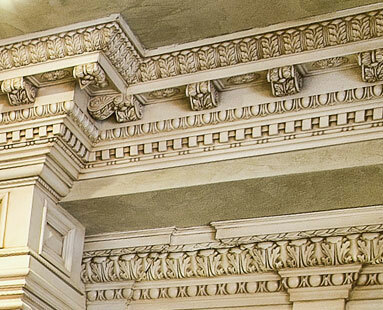 Looks just like fine moldings, will use your products next time that I renovate any part of my home. Thank you uDecor. Easy to install and looks amazing. Shipped in a few days - excellent customer service from order to delivery. Fantastic!! I love it and so does everyone else. I love it and so does everyone else. It looks fantastic! Easy to install I definitely recommend it. 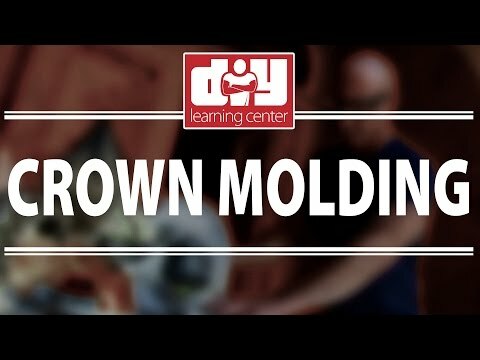 This install was a 1st for me ,but the end result looks like a seasoned pro did it.The online video was very helpful in showing how to cut, install,and finish the molding.